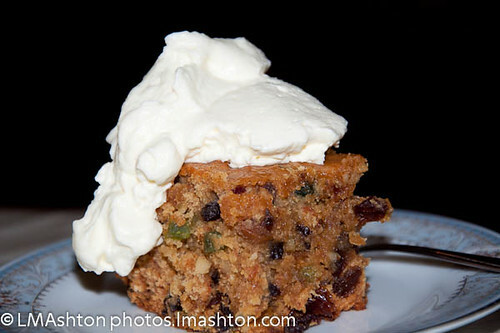 Rich Cake is another variety of fruit cake (or, as I would call it, Christmas fruit cake :)) that is commonly served at weddings and at Christmas in Sri Lanka. Since I’d recently made a coconut fruit cake, Fahim had been begging me to make a Rich Cake. Generously grease an 8″x12″ or 9″x13″ cake pan and set aside. Chop raisins, mixed glace fruit, preserved ginger, chow chow preserves and citrus peel into small pieces. Cut glace cherries in halves. Chop nuts very finely. Combine fruits and nuts in a large bowl, sprinkle with cream, cover and set aside. Cream the butter and sugar until light and fluffy. Add the egg yolks, one at a time, beating well after each addition. Add grated lemon rind, mace, nutmeg, cinnamon, vanilla extract, almond extract, and rose essence and mix well. Add the semolina and beat until well combined. Add the chopped fruit and nuts to the cake batter, stirring until fruit and nuts are dispersed evenly. In another mixing bowl, beat egg whites until stiff. Gently fold the beaten egg whites throughout the cake batter. Turn into prepared cake pan. Bake in a 180C/350F/gas mark 4 oven for about 45 minutes. Cool in pan on wire rack for 15 to 20 minutes, then remove cake from pan. Allow cake to cool completely, preferably overnight. If you don’t have or don’t like a certain type of fruit or nut, sub it with something else. As long as the weight of all the fruit and nuts add up, it’ll work. You can use desiccated coconut instead of nuts if you prefer, or another type of nut altogether. I used regular all purpose wheat flour since I didn’t have any semolina. I am ~not~ a weirdo and I have had fruitcake that was actually pretty good. It is not my favorite, however. At. All. I prefer something along the lines of a banana nut or oat bread or the cranapple walnut spice cake I adapted from the original Moosewood Cookbook. I like the cranapple walnut cake better than cheesecake or chocolate cake. Seriously. For Christmas my friend Beth sent us baklava again. Once a year is about right for that sort of richness. I came here in search of a Larabar recipe! I must try your lemon coconut one. Re: semolina, they do mean the cream of wheat granular thingies. All the Sri Lankan families I know use that. And yes, the ounces here are a measure of weight (dry ounce). Liquids, however, are measured by volume (fluid ounces). At least that’s the way I understand it. From what I can tell, semolina and cream of wheat are exactly the same thing going by different names. We’ve used semolina to make a cream of wheat type cereal that turned out exactly like cream of wheat, so it’s certainly at least completely interchangeable. The rich fruit cakes my grandmother makes now – up to 350 over the past three decades, she estimates – are a direct descendant of my parents’ nuptial cake. The child bride and groom who grew up to produce two children: my sister, a baker. And me, a burner. Too lazy to measure properly and set the timer. This cake is awesome.please let me know What do you mean by item No 9- 30g (2 T ) cream. Thanks. For cream, you can use whipping cream, double cream, half & half, or any other dairy product that has at least as much milk fat as whole milk, but preferably more. Whipping cream usually has at least 35% milk fat, so it lends a nice, rich texture. You can use whole milk, but of course the richness will be decreased. Depending on your preferences, that can either be a good thing or a bad thing. I usually use whipping cream, but if I only had another kind of cream on hand with a lower milk fat percentage, I would certainly use that instead.